ROCHESTER, N.Y., April 15, 2013 – Raw Materials, Transportation, Power, Water, and Infrastructure: six words that are often heard in conjunction with key priorities for the biofuels industry to succeed over the next decade. Mike Alt's response to that topic contains just three words: Eastman Business Park. 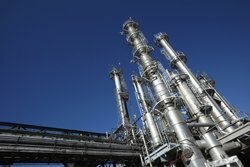 “With a mature transportation system able to handle reliable supplies of raw materials nearby, competitive energy costs, abundant water, and an onsite bio-refinery within strategic proximity to key markets nationwide, Eastman Business Park is uniquely positioned with the infrastructure required for efficient, economical biofuels production," stated Alt, director of Eastman Business Park (EBP). “The EBP infrastructure supports the biomass-to-biofuels technology very well," Alt said. “Best of all, it's already built." An ample supply of various biomasses (corn stover, woody mass and potential energy crops) is easily accessible within a small radius of Eastman Business Park, combined with the ability to refine, store and ship biofuel products, Alt said. The Park's integrated road and rail system offers capabilities for transporting the materials on a year-round basis – coming to the Park and departing from it to major hubs across North America. The Park's infrastructure includes on-site storage options and various methods of moving required volumes through the receiving system – an increasingly important factor as plant size and throughput grow, he said. EBP also possesses its own power resource. Eastman Business Park's tri-generation facility for steam, electricity and chilled water is self-contained in every aspect. Steam is used to 'co-generate' electricity and to 'tri-generate' refrigeration for process and comfort cooling. In addition to cost-competitive utilities, EBP offers water quantity; water quality; and the infrastructure for handling water treatment – all important factors in biofuels production. “We have abundant water supplies – access to 50 million gallons of water per day – plus the capability to treat up to 300 gallons per minute to produce high purity water," Alt said. The facility's dedicated industrial wastewater treatment plant utilizes physical, chemical and biological processes to treat up to 36 million gallons per day, Alt said. “Companies on-site simply discharge their effluent right into the system without pre-treating it. That saves a lot of time and money." Eastman Business Park facilities are also uniquely designed to support chemical manufacturing, and offer biofuels and biochemistry companies not only space, but a multitude of unique features and amenities. “Within EBP's 1,200-acre site are 150 acres of shovel-ready parcels, plus up to 2.5 million square feet of existing building space for office, manufacturing, laboratory or warehousing in any configuration," Alt said. These onsite facilities are directly applicable to the chemistry needs of biofuels manufacturers, including a solvent recovery facility which can serve as a bio-refinery to support high-quality biofuels production. Some companies are using the facility to purify their raw materials: “They're sending it here. We're processing it and shipping it back for manufacture," said Alt. This includes a biofuels company that has given KODAK Solvent Recovery the task of purifying millions of gallons of biofuel, so they can sell the alcohol-based biofuel for use in a variety of renewable applications, according to Alt. Another locally-based company that 'upcycles' food waste for conversion into animal feed, fertilizer and biofuels – has identified EBP as a top site to locate a fermentation facility for the purpose of processing millions of pounds of organic waste into E-10 and E-85 ethanol. KODAK Specialty Chemicals – both a development entity and manufacturing facility – can make bio-based chemical compounds to replace petroleum-based alternatives. And it has the analytical tools to test the product and verify the process. Using the pilot resources offered by KODAK Specialty Chemicals, Sweetwater Energy recently devised an economical way to generate separate and concentrated individual streams of C5 and C6 sugar solutions. Alt said Sweetwater was able to use the facilities and expertise located at EBP to create the compounds, store the solutions and ship them for product testing to other locations. Potential uses range from cattle feed supplements to biofuels and bioplastics. Sweetwater recently signed two $100 million deals for those sugar solutions first created by KODAK Specialty Chemicals and fermented by Sweetwater. “In aggregate, we have the total package here at EBP," Alt said. “We have the utilities infrastructure, water and wastewater treatment facilities, access to raw materials, a mature transportation system, storage tanks, a bio-refinery and the ability to make bio-based chemical and plastic materials of the future." “Add to that the ability to test any of these products to the highest standards, and you've got everything you need right here at the Park," he said. For more information on Eastman Business Park, visit www.eastmanbusinesspark.com or call Mike Alt, Director at 1.585.975.9360 or email michael.alt@kodak.com.